SCONE now supports full Tensorflow in addition to TensorFlow Lite inside Intel SGX. Read our overview to learn more. SCONE supports now multiple stakeholders that do not necessarily trust each other. Read our overview to learn about the multiple stakeholder protection that SCONE provides. We added a new Vault image sconecuratedimages/apps:scone-vault-latest and some description and demo on how to use scone vault. We demonstrate how SCONE simplifies the encryption of inputs and scripts such that one can implement always encrypted secure remote execution. We introduce this functionality with the help of blender (ray tracer) in our secure remote execution tutorial. We show how to encrypt application code and user input in our advanced blender use case. 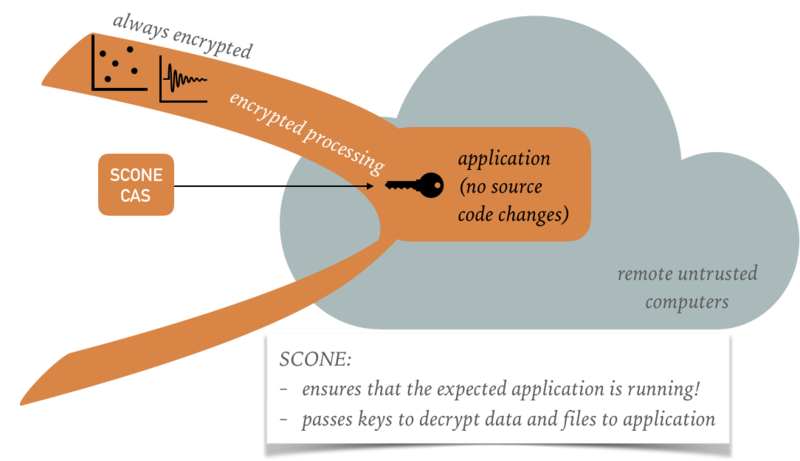 The SCONE platform facilitates always encrypted execution: one can run services and applications such that neither the data nor the code is ever accessible in clear text - not even for root users. Only the application code itself can access the unencrypted data and code. 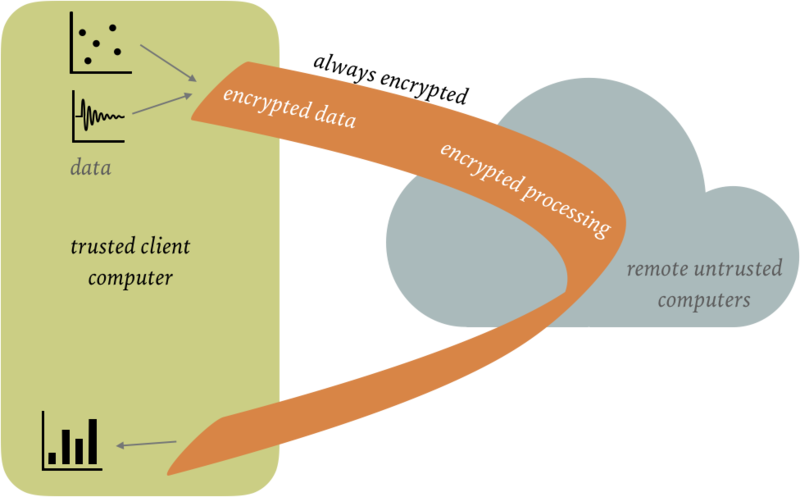 SCONE simplifies the task of encrypting the input, executing the service/application in encrypted memory on an untrusted host, transparently encrypting the output and shipping the output back to the client. SCONE helps to ensure that data, communications, code and the main memory is always encrypted. To do so, SCONE needs to verify (i.e., attest) that the expected application code is running in a trusted execution environment on a potentially untrusted host. Read our secure remote execution tutorial to see how to perform an encrypted remote execution in a single step. In this way, one can even execute encrypted code. We show how to execute encrypted Python scripts in the context of blender. SCONE can help you to encrypt your input and output data on your local computer. The keys are managed with the help of SCONE CAS (Configuration and Attestation Service). SCONE CAS itself runs, of course, inside an enclave. It can either run on the client side or on a remote host. It can even be operated by an untrusted entity and still be trusted by CAS clients. SCONE supports multiple stakeholders that do not necessarily trust each other. SCONE supports users, service providers, application providers, data providers and infrastructure providers. They can all work together and SCONE can ensuring that each party can protect its own intellectual property. 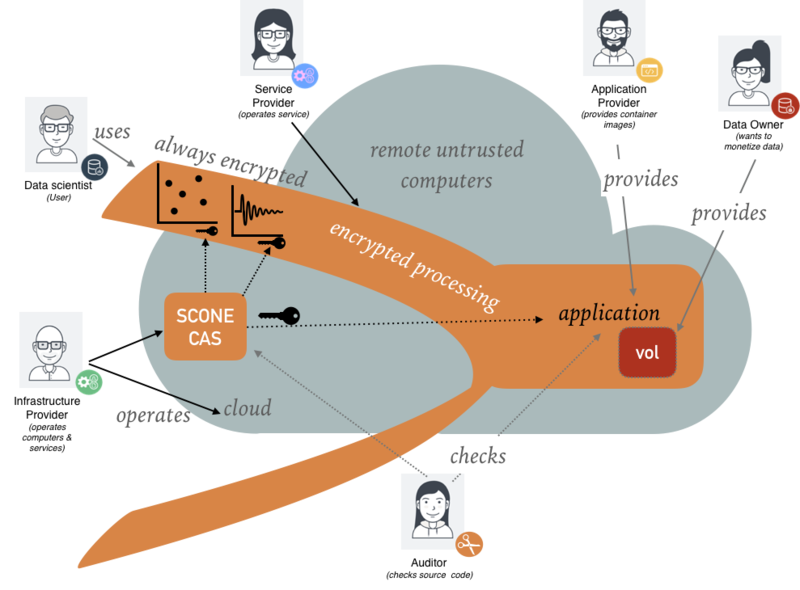 Some of the services, like SCONE CAS, can be actually operated by not necessarily trusted stakeholders since clients can verify that the services are in the correct state. © scontain.com, January 2019. Questions or Suggestions?